We might be slightly biased but Auckland is one cool city. The place we call home is brimming with mouth-watering eateries, boutique shopping and epic things to do. And while we love each and every suburb in Auckland, there are some we hold super close to our hearts… including Britomart! 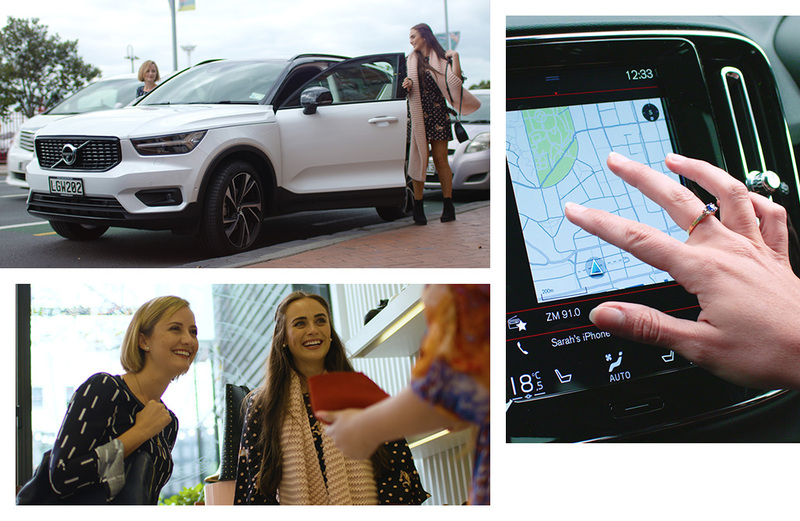 To celebrate Auckland’s loveable ‘burbs, we teamed up with the new Volvo XC40 to bring you guides to Auckland’s fave suburbs. The compact SUV is the perfect car to navigate #aucklandlife. Take on those tight carparks with the self-parking function (best invention, ever), never get lost with the centre display touch screen and pop everything important to you in the roomy storage spaces. Yep, you’ll be gettin’ around Auckland in style! To kick-start our urban adventures, we’ve rounded up our favourite spots in Britomart. Stay tuned for Ponsonby and Takapuna! Xuxu serves two of the world’s tastiest treats: dumplings and cocktails. Total match made in heaven, right? Their mouth-watering dumplings are served in oh-so Instagrammable bamboo steamers with flavours such as ginger prawn, tofu shiitake and an unmissable spinach with water chestnut. Don’t forget to pair with a fragrant cocktail like the ‘guilty pleasure’ showcasing rum with coriander, coconut, mango and lime (our fave). Pro tip: Xuxu’s sleek, intimate vibes make it the perfect date night venue. Let’s be honest, the Italians have really outdone themselves when it comes to introducing the world to all sorts of deliciousness. Gelato, pizza, espresso and pasta, glorious pasta! If you love pasta and other Italian fare (you do), head to Amano. The restaurant mills its own flour before making every type of pasta under the sun. Finish your linguine with a takeaway pastry from the on-site bakery. And trust us when we say: the French-esque crème brûlée doughnut is to die for. Wardrobe in need of a refresh? You’ve come to the right ‘burb. Britomart is a total shopping hub with all your fave brands in one shoppable space! We’re talking New Zealand’s hottest fashion designers including Deadly Ponies, Juliette Hogan, Karen Walker and Trelise Cooper. Oh, and satisfy your shoe obsession at Kathryn Wilson’s beautiful boutique store—her winter boots and loafers are totally enviable. Arms loaded with shopping bags? Pop them in the boot of the Volvo XC40 with the hands-free automatic open—it’s life-changing! Britomart isn’t really top-of-mind when it comes to walking spots… but it should be! The urban space allows for a perfect walk‘n’talk catch-up followed by brunch (obvs). Wander through Takutai Square and to nearby Queens Wharf. There’s always something happening at both these spots: the square is home to a Saturday morn market and the wharf regularly hosts art exhibitions and food trucks. If you’re really up for a stroll, head west to North Wharf and along the Westhaven Promenade. The views of the Waitemata Harbour are nothing short of spectacular! What’s better than an amazing meal? An amazing meal with equally amazing views, of course! Experience the best of both worlds at Ostro. Sitting pretty on the second floor of the Seafarers Building, the restaurant-slash-bar doubles as the perfect vantage point of the harbour. Enjoy the ocean views with an inspired menu to match. No visit is complete without diving into a lavish seafood platter loaded with the likes of oysters, prawns and crudo. Sign. Us. Up. Need an escape from the daily grind? Head to Britomart for some well-deserved TLC. Have your hair styled at Dry & Tea’s blow wave bar, get your brows done at OFF & ON then finish with a rejuvenating peel at The Face Place. Britomart does it all! Allow yourself to sink into a deep pampering slumber knowing that your valuables are locked up in the Volvo XC40’s hidden boot storage—ahh bliss. Save Room For Dessert At Miann! Polish your visit to Britomart off in the best way possible: with an irresistible treat (or two) from Miann. Here you’ll find a cabinet is brimming with petit gateaux (translation: little cakes), macarons, chocolates and gelato. We can’t go past Miann’s dedicated hot chocolate menu. Yes, you read right—a hot chocolate menu. There are six decadent delights to choose between including the unmissable ‘guanja’ made with chilli chocolate and Italian meringue. Britomart, you’ve certainly got it goin’ on. Explore the happening ‘burb in Volvo’s new XC40. Designed for city life, it’s the perfect urban explorer! Editor’s note: This article is proudly sponsored by Volvo and endorsed by The Urban List. Thank you for supporting the sponsors who make The Urban List possible. Click here for more information on our editorial policy. Video and image credit: Jamie McKenzie from Prue Productions. Talent dressed by Leo + Be.